North Carolina's latest addition has made headlines around the world and now it's gone into orbit. 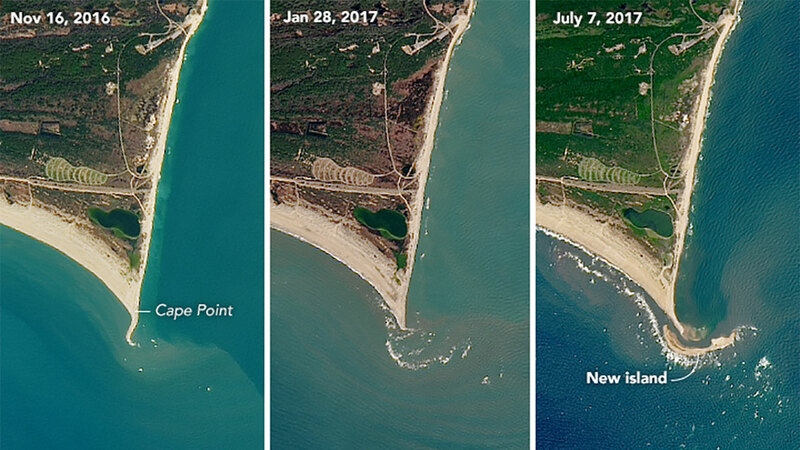 NASA's Earth Observatory released a series of satellite photos that shows Shelly Island's growth from nothing to its size now (a mile long and several hundred yards wide). The first photo taken in November of 2016 shows the area before the island's formation. The second photo taken in January of 2017 shows waves breaking on the shallow region off the cape's tip indicating the formation of the island. The last photo was taken this month. NASA is now using the images to learn about how shoals can develop into islands. "What exactly causes a shallow region to become exposed is a deep question, and one that is difficult to speculate on without exact observations," said Andrew Ashton, a geomorphologist at the Woods Hole Oceanographic Institution is quotes as saying on the Earth Observatory website. "A likely process would be a high tide or storm-driven water elevation that piled up sediment to near the surface, and then water levels went down exposing the shoal. Waves then continue to build the feature while also moving it about." A new island, being called "Shelly Island," has appeared off the coast of North Carolina near Cape Hatteras. "It's a dynamic area. Because of the two different currents -- the Gulf Stream and the Labrador Current -- the sand is always shifting and moving," Mark Dowdle, the deputy superintendent of the Cape Hatteras National Seashore, which oversees the island, told ABC News soon after the island's formation made headlines. Shelly Island first made headlines back in June. Since going viral, its popularity has prompted officials to issue a warning to visitors and it had to be evacuated after a World War II ordnance drifted to shore.